Master Saleem Jehangir was born in Jaipur (India) in 1946 and completed his early and basic education from Punjab and Karachi. He then left for the USA for higher studies and graduated in Mechanical Engineering from the University of Michigan (Ann Arbor) in 1968 and went on to complete his Master's degree in Business Administration. 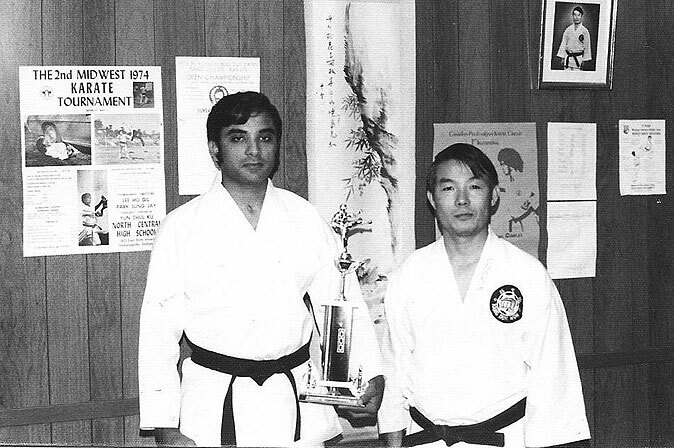 Master Jehangir studied Tae Kwon Do under Grand Master Hwa Chong at the University of Michigan (Ann Arbor) during the period from 1965 through 1981, and taught the same at the University of Michigan and the National Sports Training & Coaching Center (NSTCC) in Karachi. Grand Master Hwa Chong is the pupil of Great Grand Master Park Chul Hee in Korea, one of Korea's senior most pioneers of the martial arts. Master Jehangir was the pioneer of Tae Kwon Do in Pakistan. He had the privilege of founding the Taekwondo-Karate Association of Pakistan as well as Pakistan's first Tae Kwon Do school at the NSTCC in 1971. Master Chong, as we all called him, and now the Grand Master Hwa Chong as the world calls him, was my teacher, my coach, my mentor, my trainer, my philosopher. I have not seen him after 1981, but he has been in my thoughts, and his philosophy and sayings still echo in my mind as I confront obstacles in my life, and I use the defensive dodge and offensive techniques to tackle them. This is what Master Chong left behind for all of us, a way to approach life and handle its problems. I remember once I was very depressed, I was unemployed, had a wife and a child to support, and the US economy was in shambles. I had applied for hundreds of jobs to no avail. So I went to Master Chong and asked him what should I do. He said in his typical calm philosophical demeanor: learn from the animals, when the weather gets bad, they go in hibernation. That one simple advice brought my spirits up, and I looked in the World of Nature around me and started to observe and learn how the animals survive the ups and downs of their lives, and found my answers. Master Chong would constantly give us these simple, small pieces of advices. And they would stay with us and guide us throughout our lives. His latest advice to me was to change with the times, or else I will end up as The Last Warrior. He was of course referring to the movie and the message there in. Master Chong was a student of Master Park Chull Hee, who was a 7th Dan black belt in 1966 and one of the senior most masters of his time. We never met Master Park till 1974 when he came to attend the First All American Inter-Collegiate Tae Kwon Do Championships in Ann Arbor, Michigan. We knew him through Master Chong and through his book that he had written in Korea. Master Park was the senior student of the Great Grand Master Yoon Byung-in who was a very famous figure of his times and a pioneer of the art of Tae Kwon Do in history. They all belonged to the Kang Duk Won Association in Korea. Kang Duk Won was one of the original nine Kwans (clubs or academies) that eventually merged to create the Kukkiwon system. This Kwan was founded in the late 1950s by former students of the YMCA Kwon Bop Bu (Chang Moo Kwan), Yoon Byung-In, Hong Jong-Pyo, and Park Chull Hee. Today, Kang Duk Won still exists in Korea and is officially known as the World Kang Duk Won Tae Kwon Do Federation with Grand Master Hwa Chong as its President. Master Chong came to East Lansing in 1966, and joined the Michigan State University to complete his Master’s degree in Economics. He was requested by the University of Michigan to lead the Tae Kwon Do program at the UM Physical Education Department. He graciously accepted the assignment and began commuting two days a week from East Lansing to Ann Arbor to teach the classes. We were thrilled to see a Korean master of the art teaching us. It was The Real Thing. It is our fortune and good luck that he would later turn out to be the one and only, Grand Master Hwa Chong. But it is not his fame that benefitted his students as much as his training and philosophy. He would make the physical part of the training subservient to the philosophy of the art. His oriental accent made him even more mystical and attractive. His limited vocabulary actually helped him in teaching us the philosophy in a few words. Master Chong used to call me Saleem. I must have been one of his favorite students because he used me to demonstrate all the techniques by whipping me around. He paid special attention to my weaknesses and delayed my black belt a whole year till I harnessed my temper. In my first black belt exam when I completed four years of training, he made me fight a very skilled fighter of Italian descent who was a third degree black belt. That fighter literally floored me twice with his kicks to my head. He was limber, very athletic, very fast and focused. I was no match for him. When he floored me the third time, the Pakistani in me woke up and I lost my cool. I picked him up and threw him to the ground. Most of my colleagues were joyous at this, because he had whipped many of them before. But Master Chong became angry that I had lost my temper. He said: Saleem, you are not ready for black belt yet. I trained for one full additional year, after which he tested me again against a fighter who was one of the black belt champions in Michigan. I fought him with full composure and force, and showed full control of my temper. The fighter was very rough and agile. But I repeatedly scored with my reverse right punch. In the black belt exam you have to show one outstanding technique with which you can consistently overcome your opponent. In my case it was my reverse punch. At the end of the ceremony, Master Chong awarded me with a black belt, saying: now not only you are a black belt, you are a strong black belt. It took me five years to get my black belt, but that was Master Chong’s philosophy and style. 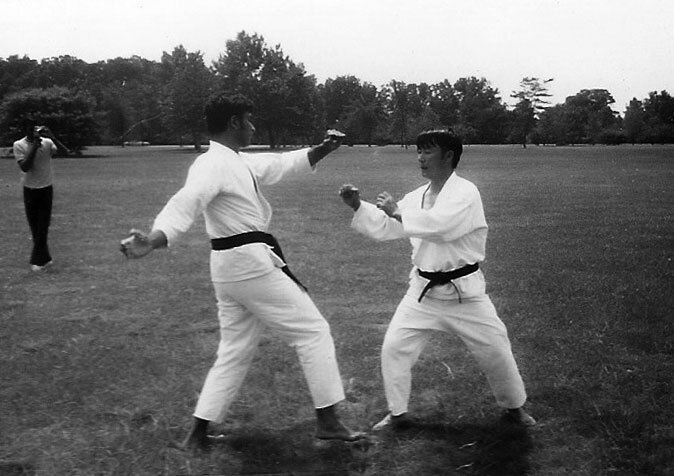 Master Chong organized the first All Michigan State Championships in East Lansing in 1969. I travelled with the UM club to participate in it. I was a brown belt then and so completed in the same category. I reached the final round in the sparring competition but lost to a very speedy fighter. Later when Master Chong saw the bruises on my face, he said that the fighter who won should have been disqualified for making contact to the face. Back then, contact to the face was not allowed because we did not use guards. The championships were very successful and I achieved instant fame from my second place win in the Brown Belt category. We all helped in organizing the First TKD All American Inter-Collegiate Championships in Ann Arbor under Master Chong in 1974. He invited all the senior masters from all over US and Korea. Joe and I competed in it also. We both lost in the sparring competitions somewhere mid-way in the tournament, but reached the finals in the forms competition. This was expected, because Master Chong taught the old traditional Tae Kwon Do style which was not conducive to winning in sport Taekwondo sparring. But his forms were the best and that is what we ended up winning. Joe Lloyd had performed his form in the best manner till the finals. All day was spent on eliminations. And then the finals took place in the evening. There were hundreds of spectators in the Yost Field House gymnasium on State Street. It was a huge gym. Having stayed out of touch with the new developments from 1971-73 (the time I was in Pakistan), I had not expected to reach the finals. I had gained 30 lbs in Pakistan and my movements had become slow. That is why despite winning some fights, I lost to the good fighters in the eliminations. They were fast and focused. But I managed to reach the finals in the form competition. I was nervous. The reason I reached the finals is because Master Chong had taught me a 5th Dan level form called Chang Kwan. It had fluid movements and was very graceful, something that fit my temperament and style. When I performed it, most of the Korean masters expressed their displeasure at Master Chong for teaching me that form. It was supposed to be taught only to high Dan masters. Anyway, when performing the form in the finals in front of a large crowd, I became a little nervous and rushed through the form. And Joe forgot the moves in the middle of his display. Consequently, Joe was placed third, I was placed second and the one who performed a lower level form but did it with full composure and stability, got the first position. Later as we celebrated our wins in a restaurant with the club members, we talked about how we never expected to do even this good. It was a very good experience. And a memorable one. And it was all due to Master Chong’s efforts. There was a picture taken of all the participants in the tournament, I am missing in the picture, and the reason is that I was up there taking this picture. But I still have my trophy, and the article in the 1976 black belt magazine, and the letter from Master Chong, all of which are testimony to my achievements. Master Chong’s achievements would become his launching pad into the national fame, he was then selected to lead the introduction of Tae Kwon Do in the American Athletic Union (the US government body, similar to Pakistan Sports Board, that governs all sports at the national level). He then became the Chairman of the AAU Tae Kwon Do Committee and introduced Tae Kwon Do in the 1988 Olympics. Tae Kwon Do was then included in the 1992 Olympics in Barcelona as an Olympic sport with Master Chong leading the US team as team manager. Some of his students won the gold medal in the 1992 Olympics. Later, Master Chong was appointed as the President of the United States Tae Kwon Do Union (USTU) from 1993 to 1996. Today Grandmaster Chong is in the Hall of Fame of Martial Arts. And I feel lucky and thankful for being one of his pupils.